A young man was arrested by men of the Nigeria Security and Civil Defence Corps for vandalizing all the fancy lights and pulling down statue of Dr. Akanu Ibiam at Abacha roundabout, Gunning Road, Abakaliki, Ebonyi State. 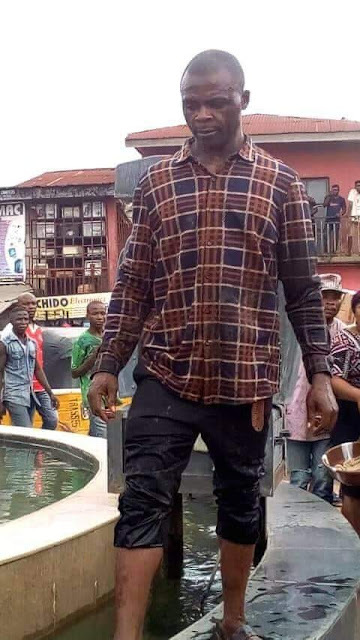 According to an eyewitness, the man came to the vicinity with Monday hammer and other instruments, climbed the artificial waterfall and commenced the destruction. Before he started, he proclaimed that evil concoctions and charms was buried in the round about before the fancy lights were installed, hence, Abakpa traders and in deed Abakaliki people were held to a ransome by the evil forces in the state from progressing and even asking for their rights. It was gathered that he removed some materials from the ground and assured the onlookers who were majorly traders in the market that, their liberation is assured having removed the obstacles on their way. He pleaded with the people not to worry about what will befall him as he was sent by the Holy Spirit and that he will not be abandoned by his sender.